1) Mods/DLC now support their own sample units folders. 4) Issuing last minute orders to moving units no longer causes impassable routes, and happens more instantly. 5) Division manager will now remember all your custom divisions if you swap to 'auto-management' and back again. 6) New GUI buttons for one-click selection of auto-managed divisions, or going to previous/next division. 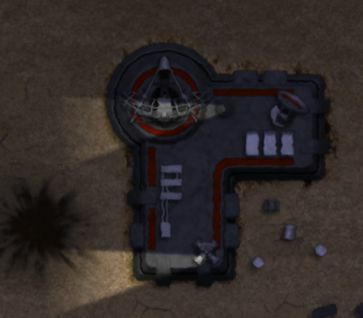 8) Improved foundation graphics for many of the turrets. The other big change is the new units in 7). 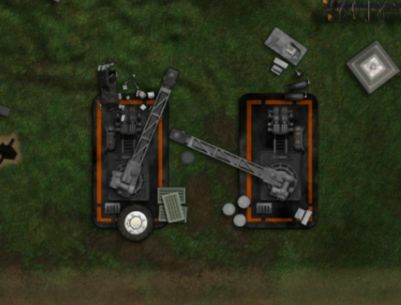 I had basically skimped on my art budget and re-used a few units rather than get new ones built, and I never really liked the old repair yard facility, or the way it was colored. The new units are better, and split into more effective layers so you can shade them better and they look more natural. Here are some screenshots showing the new units. Ok lets talk about something indie game developers don’t talk about much, but it affects quite a lot of us. Many indies these days are in teams of 3 or 4 or more people, so the problem in that case is not acute. However, the genius of al gore’s internet means that often those teams are geographically distant and scattered anyway. I have contractors and partners working with/for me in all different countries, but in the majority of cases I’ve never met those people, or even phoned or skyped them. Some people think that’s weird, but I like the idea that I’m employing people based on the portfolio, reputation and skills and that their country of origin, accent etc never occur to me. Of course the downside of this is that you sit in a room on your own with a keyboard, and there is nobody to just go ‘hey wassup?’ to. This makes me very very productive, when I need to be, but it can also be a very lonely job. For a lot of people, especially the more insular sheldon-cooper style geeks, this is not a problem. Some people at Elixir and Lionhead would sit there with headphones on and never talk to anyone at all. I found that weird, but it was quite common. Other people, like me, actually enjoy the whole ‘water-cooler chit chat about nothing’ that you get in a normal workplace. Intellectually I know this is just some primitive portion of my brain that wants to metaphorically pick fleas off fellow humans, but there’s no doubting it does make me happier to hang out with a group of buddies and chat about stuff. MSN, Skype et al, are great, and I do chat quite a bit to other indies over them, but of course it’s not quite the same. Private forums are also very good, because they become like a bar filled with friends, rather than the vast mass of trolls and flamebaters you get in most public anonymous forums. Meeting up for a beer is ideal, but generally for me that involves at least a 100 mile car journey, because if there’s a bright center to the universe, I’m in the county it’s farthest from. me at my house, yesterday. What’s the solution? Well I think it’s yet another justification for going along to indie meetups and shaking some hands. Indies can probably recognize that slightly shy, rabbit-in-headlights stare that other developers have when they spend too long debugging and not enough time actually socializing. I’m lucky in that I’m not in the home alone like I was when I made Kudos and Democracy, and I don’t suffer from paranoid shyness like some indies do. I’ve also been around quite a while now, so someone normally recognizes me at all these indie things, which is great. One indie told me that I’m ‘much less scary in real life’ which I assume is a compliment. I’m at the eurogamer expo on thursday, BTW. So I guess what I’m saying is, if you feel lonely,and isolated and it gets you down, don’t think it’s just you. This can be a lonely job, especially if the only people you chat to in your working day are family members who have no idea what you do, and are desperately hoping you will give up and get a proper job. They say the first step is recognizing you have a problem. The second step is normally to get a cat, or probably better a dog (because you need to walk it, and thus it gets you out in the fresh air that way). I’d definitely have a dog if we didn’t already have a sufficiency of cats. Any other lone wolf indies out there howling at the moon? I was rambling to someone a few days ago about advertising and risk, and something hit me about indie attitudes to risk and promotion. I know a lot of indies who never do any advertising. I don’t mean word-of-mouth promotion, tweeting, updating facebook and sending people press releases, that’s PR, it’s not advertising. I actually mean paying for banner ads, and search advertising, and even print or video adverts. For most smallish indie teams, the advertising budget is zero. it’s easy to work out why. 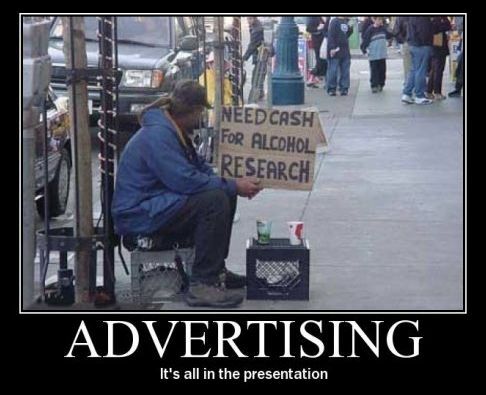 Advertising often seems to give a low Return On Investment (ROI). You can do your best to measure it’s effect, using tracking cookies and lots of charts and graphs. I do a lot of that myself, and just about manage to be sure that I am getting a small, but measurable ROI. The problem is that it only really works accurately for your direct sales. if you run $1,000 of banner ads on www.randomgamessite.com. and then track 500 visitors from clicking them to your site, and then witness 50 sales and calculate it as $1,000 then you know you got your money back. The problem is, if steam + impulse + gamers gate is 80% of your sales, you might be ‘losing’ a lot of those potential buyers to those sites, and be selling extra copies but not knowing it. All stats checking can do is tell you people left the site, not if they then bought elsewhere. Now if you read this blog a lot, you will know all this. What I’m basically saying is ‘the ROI from advertising is difficult to calculate’. And on that basis we can all forgive all those indies who never advertise. You can tell my argument from here I’m sure. Tracking a sale from a banner ad is really HARD, and vague, and ultimately you kinda have to ‘have faith’ in the power of advertising and be prepared to spend $10,000 on it before you can really tell if it’s going to work for you. Sound scary? Tracking a sale from giving out a free T-shirt at an expo is really ++++HARD v 2.0 with extra bacon and double cheese, and by the time you factor in your plane tickets, booth hire, pc hire, power surcharge, t shirts and cookies, you eat through $10k just as fast. So why do indies, (especially the more hip and young indies) vastly prefer expos and networking over advertising? I think it’s down to the ‘feelings’ associated with them. Advertising is something big evil corporate people like EA do. Something old-school. Old-fashioned and for people stuck in the past. Expos and shows are for the young and trendy people who are undermining the system from within. It’s cool. Indie Game: The movie had some footage of fez at expos, it was cool. They didn’t show them setting the budget sliders on an advertising campaign. That would not be cool. 1) New Feature: Direct control now lets you (optionally) issue orders or edit existing orders for ships mid-battle. 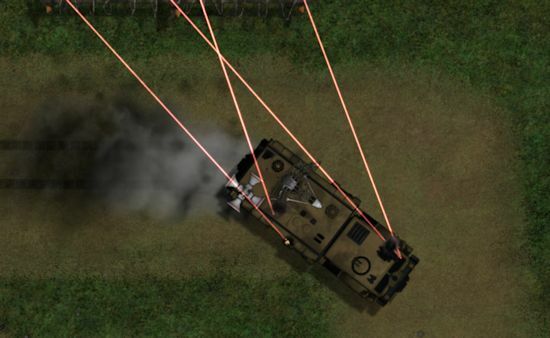 2) New Feature: Shockwave distortion and shield impact distortion effects have been added. Essentially, I have added an option to singleplayer GSB battles that lets you play the game like an RTS. For all those people who hated one of the central elements of the game (no control during battles), you now have that as an option. If you have played the game before, you might enjoy giving it a spin with the new option. (Sorry, the demo isn’t updated with this feature yet). If you were always on the fence about buying the game (which you can get here) because of the lack of control, now is the time to buy :D.
This is patch number 60, so it took me a while, but I thought ‘what the hell’. I demonstrate how it works, along with some new visual effects added in this patch, in this video below. Please upvote it, or retweet it, or do what ever trendy things you socially-enabled gamers do these days. It’s much appreciated. And tell me what you think of it, too. BTW it’s a free update, not DLC. This update *will* make it to the steam copy, I just need to get them to update it. 3) Tripled the maximum supported submunitions per missile from 6 to 18, as requested. 4) Game now supports instant re-start with new settings from the options screen. 5) In mass-deploy mode you cannot now accidentally snap out of it by selecting an existing ship, which was annoying.